The home was built by two construction workers and the couple themselves, who were familiarized with the construction process and had backgrounds in industrial engineering. “We did not have blueprints for this design, and created only a 3-D model to guile them along the way,” Saxe says. Set slightly apart, each container is installed on pier foundations. Wood floors were installed throughout the entire house. Walls are formed by simple plasterboard partitions, and enhanced with industrial-grade insulation. The kitchen cabinets were bought at a local hardware store. The couple changed the door handles for a more modern look. The home’s furniture was brought in from a previous residence. Spectacular views continue even in the bathroom, located at the far end of the home. “We managed to change a family’s life by shifting the paradigm of what it means to own a home,” Saxe says. Made of scraps taken from the containers’ sides, the roof creates a sense of openness from the inside and ushers in sunlight. Its slanted design creates a wind tower effect, providing natural ventilation that negates the need for air conditioning. The containers’ sides and ends were removed to make way for large, aluminum-framed clerestory windows that provide sweeping views of the east and west. Gabriela Calvo and Marca Peralta had a dream: to live debt-free on their property near San Jose, Costa Rica, surrounded by their horses and the natural landscape. The couple considered building with shipping containers—but were terrified of living inside a tin can. They presented their conundrum to architect Benjamin Garcia Saxe, who cleverly transformed two austere, 40-foot-long metal boxes into a home. The strikingly simple residence, named Containers of Hope, covers 1,075 square feet and cost just $40,000—less than the price of social housing provided for the country’s poorest residents. In developing the design, Saxe focused on rethinking comfort in a compact space. “The key factor was cost, which allowed them to take the risk without putting everything on the line,” Saxe says. 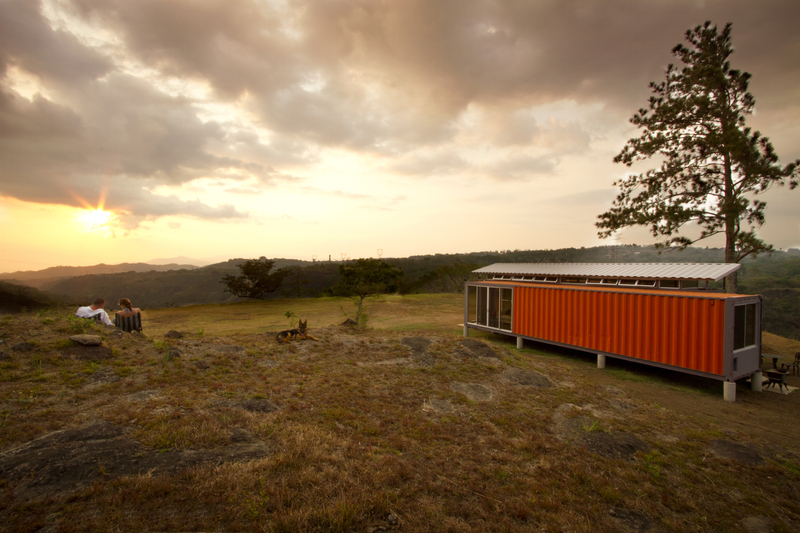 “Once they realized size wasn’t what gave them happiness—location was more important—it was easy to move forward.” Today, due to the rising cost of shipping containers in Costa Rica, Saxe estimates such a project would be about 20 percent more cost-effective than traditional methods.